On Saturday May 12th, eight students represented Corpus in the Rostrum Voice of Youth Public Speaking semi finals in Floreat. The students represented the College with confidence and great ability and it made me so proud to be associated with these young people. All students needed to present a prepared speech (6 minutes Junior/ 8 minutes Senior) as well as delivering a 3-minute impromptu speech after 15 minutes preparation with no access to information. The students’ speeches were truly inspirational but, as one would expect, the competition is intense at this level. However, I am delighted to inform you that we have 4 students proceeding to the State Finals. 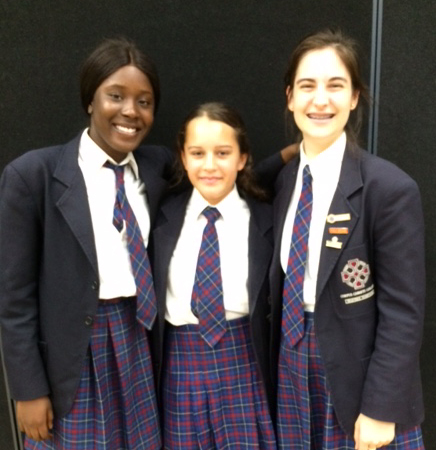 Gianni Petta, Mosaia McDonald, Ike Adesanya and Rachael Dellaca will deliver a new speech in the state competition on the 23rd June at The Cambridge Library at the Floreat Forum. Olivia, Emma, Hugh and Chelsea narrowly missed out on progressing through after facing tough competition in their heats. However, for all these students, it was their first attempt at this level of competition and I am confident that the experience they gained on Saturday will stand them in good stead. Thank you to all the students for their commitment and enthusiasm in taking up the challenge of public speaking. I am so grateful to the parents and families of our competitors who came along to support and encourage them. This support made all the difference on the day. If you would like to hear them, along with the speeches from all our talented public speakers, come along to the Corpus Christi College Public Speaking Competition which is being held on Wednesday 27th June at 6.30pm for a 7.00 pm start in the Sadler Centre. Please email me if you would like to attend.